KUALA LUMPUR (Feb 5): Malaysia’s ringgit fell the most in two weeks after the European Central Bank tightened terms for Greece’s access to financing, damping risk appetite as oil resumed its decline overnight. The ECB said it will no longer accept Greek bonds as collateral for loans, citing doubt over the new government’s commitment to reform pledges made under the previous administration. Brent declined 6.5 percent Wednesday in its biggest loss since November, before rising 1.3 percent in Asia today. Malaysia is Asia’s only major oil exporter. “There is generalized risk aversion after the ECB essentially yanked the liquidity line,” said Vishnu Varathan, a Singapore-based economist at Mizuho Bank Ltd. “The drop in oil prices” was also weighing on the ringgit, he said. 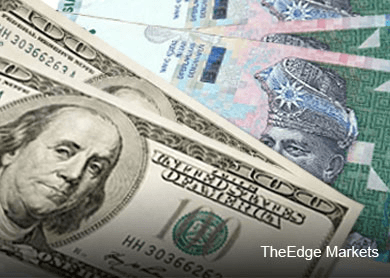 The ringgit retreated as much as 0.8 percent and traded 0.5 percent lower at 3.5833 a dollar as of 9:35 a.m. in Kuala Lumpur, according to data compiled by Bloomberg. The currency posted its biggest gain Wednesday since September 2013. A report due at noon in Kuala Lumpur may show Malaysia’s exports increased 1 percent in December from a year earlier, after gaining 2.1 percent the previous month, according to the median estimate in a Bloomberg survey. The trade surplus is forecast to narrow to 9 billion ringgit ($2.5 billion) from 11.1 billion ringgit. China, Malaysia’s second-biggest overseas market, reduced the amount of cash lenders must set aside as reserves as global central banks ease policy to spur economic growth and ward off deflation. The reserve-requirement ratio was cut by 0.5 percentage point effective Thursday. Malaysia’s sovereign bonds were little changed, with the 10-year yield at 3.77 percent, data compiled by Bloomberg show. It dropped four basis points, or 0.04 percentage point, Wednesday.